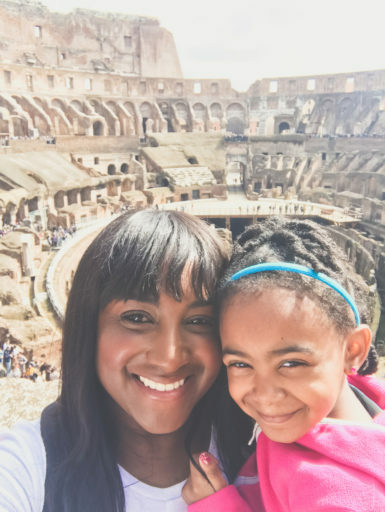 This is an itinerary of places to visit in Rome in 3 days with [or without] kids. Rome is such a beautiful city with so much to see, do, and eat! Most traveling websites recommend at least a week but what if you’re short or time [or just prefer speedy trips like us]? 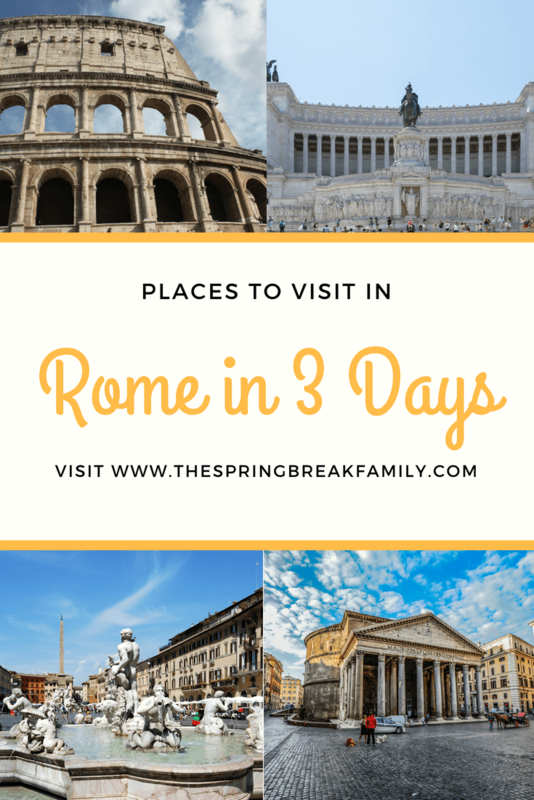 Well, here is a breakdown of how to make the most of places to visit in Rome in 3 days. 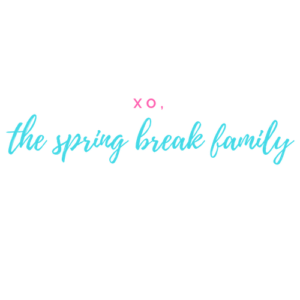 And don’t worry — all of these activities are perfectly kid friendly! If you want to see exactly how we spent our three days in Rome, check out our trip recap! Romans [and Europeans in general] aren’t as big on breakfast as Americans are so we skipped that in this itinerary. Do yourself a favor: grab a pastry and a cappuccino from the closest cafe, devour them at the counter, and enjoy breakfast like a true Roman! This nondescript little restaurant is a jewel in the area! Many tourists worry about ending up in a “tourist trap” restaurant but this one isn’t that at all. 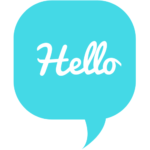 Everyone is friendly, attentive, and most importantly – the food is delicious! 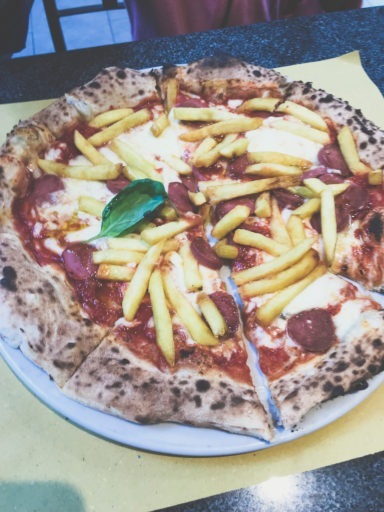 We even had a pizza with french fries on it. Yes, it’s as weird as it sounds but the girls loved it! It’s just a short walk from the Colosseum and definitely worth the visit! If you have kids, this would be good time to take a nap! Well rested kids = happy kids. Admission to the Roman Forum is included in your purchase so after lunch, swing by and check it out! It can be confusing to navigate so pack your patience. Also, please note you might have to wait in line to enter. This hill is only one of the seven hills of Ancient Rome but it is home of some of the coolest monuments in Rome. 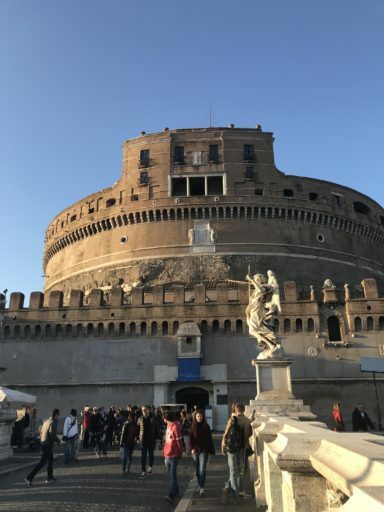 Visit the Victor Emmanuel Monument [Monumento Nazionale a Vittorio Emanuele], sit at the Piazza del Campidoglio, and drop in on Santa Maria in Aracoeli. This is as it is named: a staircase in the middle of Rome near the Spanish embassy. 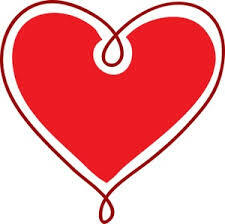 But it is a great place to hang and socialize. Or climb to the top of the stairs and enjoy the view of the city! If you have time, check out the church of the Santissima Trinità dei Monti and its surrounding piazza at the top of the stairs. There is no seating at this very popular eatery in Rome but don’t let that deter you! They make two different types of pasta fresh and in-house every day. Priced at less than 10 euros each, it’s a great deal for families and solo travelers alike. Plus, it’s very close to the Spanish Steps. Just don’t eat them there or you could face a hefty fee. Who doesn’t love a place that literally has chocolate coming from the ceiling? Stop in for some of the tastiest chocolate in Rome from chocolate candy to hot chocolate to even chocolate cigars. There are several locations in Roma so take your pick! The Pantheon is a cool [free!] little church in the middle of Rome known for its huge hole in the ceiling. If you want to be technical, it’s called an occulus. Whatever the name, it is a beautiful piece of Roman history and a definite must see! 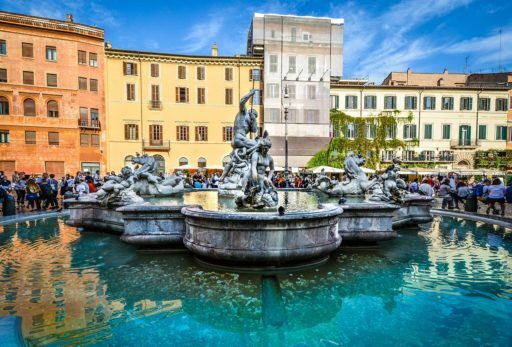 Check out the Fontana de Pantheon and its surrounding piazza while you’re there. This is another free attraction in Rome. Filled with merchants selling fresh fruit, herbs, and all sorts of goods, Campo Di Fieri is a Roman institution. Come hungry and inquisitive! Oh, and bring cash! I’ve said it before and I’ll say it again — I LOVE Piazza Navona! It’s so filled with life and good energy. Take selfies at the Fountain of the Four Rivers, dance with some street musicians, and take in the scene. Eating within the piazza can be sometimes good, sometimes bad, and almost always expensive. However, if you’re up for the [slightly] higher lunch bill check out Il Tagliere Toscano Navona. They mostly serve paninis with meat and cheese boards. It’s a super Italian meal and totally worth it!If you’re up for an even bigger splurge that comes with a stunning view, check out Terrazza Borromini. The reviews about their food is mixed but their rooftop views almost make it worth the chance! This isn’t the most kid friendly area of Rome but is definitely still worth the visit. The streets are narrow and sidewalks can seem non-existent in this area so keep that in mind with kids walking or if you’re pushing a stroller. Despite the lack of space, it is still a great area to explore! Climb Gianicolo Hill, grab gelato at one of the many options in the area, stop at the Basilica of Santa Maria, and just take in the sights. Tired of sweets, yet? Trick question since you can never get tired of sweets! While you’re in the area, stop by Giselda Forno for a treat. Or two. Or three! They also serve pizza and other items here if you decide to skip Pimm’s for dinner. You can also grab some to go for the next day’s breakfast. This lovely rotund building was initially meant to be tomb but was eventually transformed to the castle that’s available to visit today. I know how tired things can feel at this point of the itinerary [and you have a big activity scheduled next], so it is perfectly acceptable to skip entering here and just take pictures from the outside. However, if you decide to venture inside, there is a pretty neat museum. As a bonus, kids are free! You’re also able to climb to the top for a wonderful view of the area. If you didn’t venture inside Caste Sant Angelo, feel free to skip this one. You can always grab lunch at Vatican cafeteria. If you did go inside and came out hungry, then head over to Pastaciutta. It’s like Chipotle but for pasta! Meals are made in less than 5 minutes and it is all made to order. The pasta is even made in house. The nature of the food makes it very kid [and adult] friendly! Plus, it is very affordable at less than 10 euros each. There is very little seating in the restaurant so plan to have it as take away. Did you know that the Vatican City is actually the smallest country in the world? Even though it is located within Rome, it is its own sovereignty. This place is HUGE and always packed [everyone wants to see the home of the Catholic religion] so be prepared. Also, this is an active place of worship so have your shoulders covered. Visiting requires some pre-planning, comfortable shoes, and a tiny bit of patience. There are two major parts of Vatican City detailed below. This is the main attraction of Vatican City and includes the museums, the gardens, and the villas. It also includes the infamous Sistine Chapel. 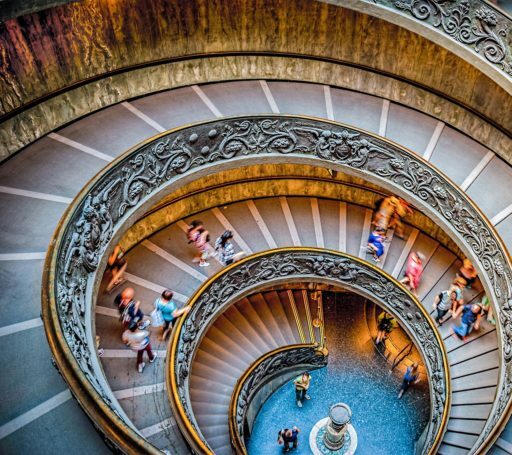 There are several different tour options available directly through the Vatican — some include meals, some include train rides, some are at night… the list goes on. If you’re balling on a budget, skip the guided tours. There are plenty of signs [and staff] to help you find your way. Plus, they are long and certified patience killers if you have small kids. I’ve read that if you have a stroller, you can skip the line — which is a perk — but please bear in mind it isn’t allowed in all areas [like the Sistene Chapel]. I still also strongly recommend that you purchase your ticket online prior to your visit. We waited in a short queue to enter, a short queue for security, and another short queue to get our tickets from will-call. It was a breeze compared to the many [MANY] people we saw waiting in line. Unlike the Vatican museums, St. Peter’s Basilica is completely free. It is, again, an active place of worship so please mind the dress code. Kids will enjoy roaming the open space and adults will appreciate its beauty. 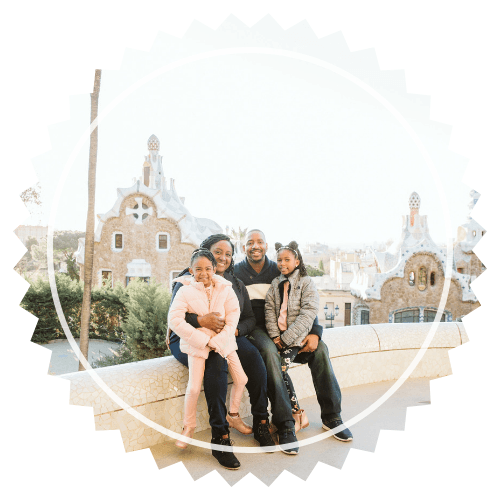 If you [and the kiddos] are up for the climb, you can get an awesome view of the area from the dome. You can’t book this portion online so you will have to wait in line. There is an option to take the stairs and another for the elevator. However, the elevator does not ascend all the way to the top so there will still be stairs. Very narrow stairs. Weigh that against the chance for a great view. It’s been a busy day and you deserve a nice, seated dinner. Indulge the family with a nice dinner at Perdincibacco. This charming restaurant is known for their pasta and seafood. They are a short walking distance from the Vatican museums and a nice end to a long day. Sorry to had pause for a second to catch the drool. Just please try it out. If you do, let me know what you think! What would you do during 3 days in Rome? Feel free to leave a comment below! 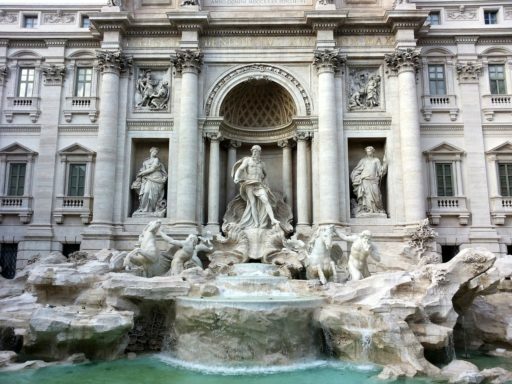 Beautiful writeup..so detailed …..Rome for sure is a lively destination.. Thank you so much, Krish! Hope it is helpful! !